Noble Gases are located in group 17 on the periodic table. All atoms of the same element must have the same atomic number (# of protons). The maximum number of electrons in the second energy level of an atom is 10.
has a negative charge, therefore it is an anion. Elements arranged in horizontal rows in the periodic table are called periods. The particles of matter that have about the same mass as protons ____. In which of the following is the number of neutrons correctly represented? Two isotopes of carbon are and . If E is the symbol for an element, which two of the following symbols represent isotopes of element E? In a neutral atom the number of protons are equal to the number of ___. neutrons balance the protons and electrons. nuclear forces stabilize the charges. the numbers of protons and electrons are equal. the numbers of protons and neutrons are equal. one proton, two neutrons, and two electrons. one proton, two neutrons, and one electron. two protons, one neutron, and one electron. an equal number of atoms. 20 times as many atoms. is the mass in grams of one mole of a substance. is numerically equal to the average atomic mass of the element. 1.2 1023 atoms of Au. 4.3 1023 atoms of Au. 2.3 1023 atoms of Au. 6.02 1023 atoms of Au. What is the mass of 2.5 mol of Ca, which has a molar mass of 40 g/mol? A sodium atom, which has 11 electrons, has _____ electron(s) in its third energy level. one mole of a substance. one gram of a substance. one liter of a substance. one kilogram of a substance. the number of particles in one mole of a substance. the SI base unit that describes the amount of a substance. the amount of a substance necessary to have a positive charge. the mass in grams of one mole of a substance. Which of the following elements is an alkali metal? What is the mass number of the atom shown above? 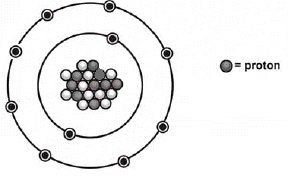 Which is the correct symbol for this atom shown above? All atoms of the same element have the same ____. Which of the following sets of symbols represents isotopes of the same element?